I grew up with certain core values when it comes to meals – a fancy dinner is all about steak night as are details such as cloth napkins and a wine list. I must admit it’s been quite some time since I have eaten at a Longhorn restaurant but I still associated it with more of a roadhouse concept. That is until I recently attended a local blogger dinner and was able to sample everything from appetizers to desserts and left very pleasantly surprised, and very full. Our dinner event was hosted at the Longhorn near Rivergate Mall on Gallatin Road,which I learned is one of the long-established restaurant locations in the entire chain (it’s been around 20 plus years) and it was a dark and drizzly night…perfect for a warm and juicy steak dinner. First of all I learned quite a bit about the chain, which was founded in Atlanta. Longhorn never freezes their meat, from steaks to chicken, so the emphasis is on fresh. They have their own signature seasoning, and we were lucky enough to go home with a sample. Longhorn also makes their own blue cheese and ranch dressings. First things first we sampled several amazing appetizers. 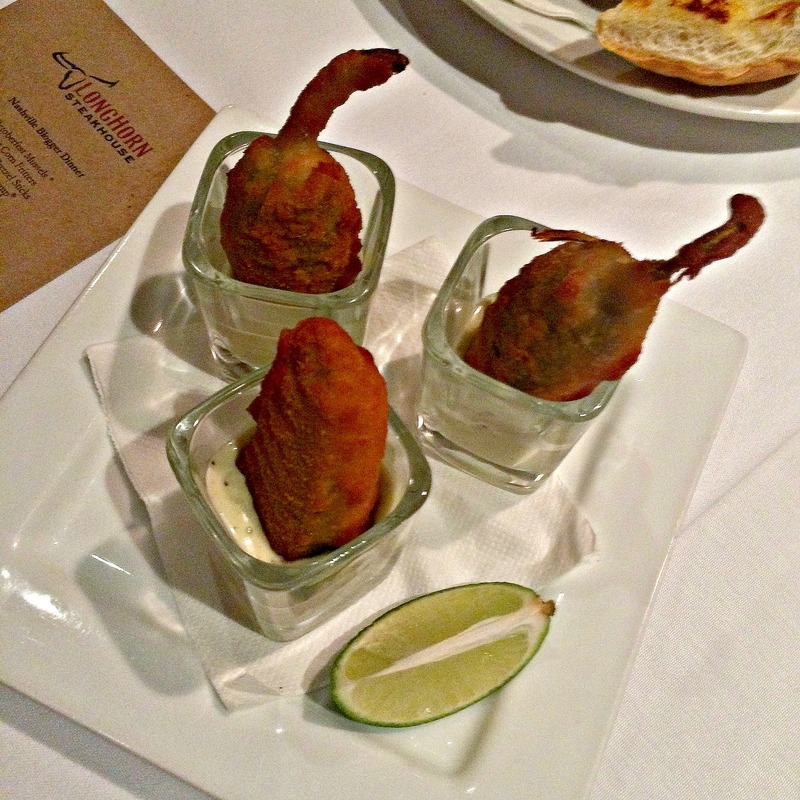 Longhorn frequently changes up its menu to feature seasonal items, such as the Octoberfest Mussels. I was particularly fond of the Sweet Corn Fritters, Brew Pub Pretzel Sticks (the beer cheese dipping sauce is TO DIE FOR people) and the Crispy Jalapeno Shooters. I was a little reticent to try them as I’m not a huge fan of spicy foods, but they were amazing and not too hot. The Wild West Shrimp app is one of the most popular appetizers Longhorn offers and while I liked it, I didn’t love it as much as the other apps I sampled. After the appetizer sampling, we had a choice of soup or salad and despite the weather I opted for the Blue Ridge Wedge Salad once I heard that the blue cheese dressing, my fave, was homemade. It did not disappoint! Most wedge salads are very predictable, but this one surprised me in a good way, a very good way. 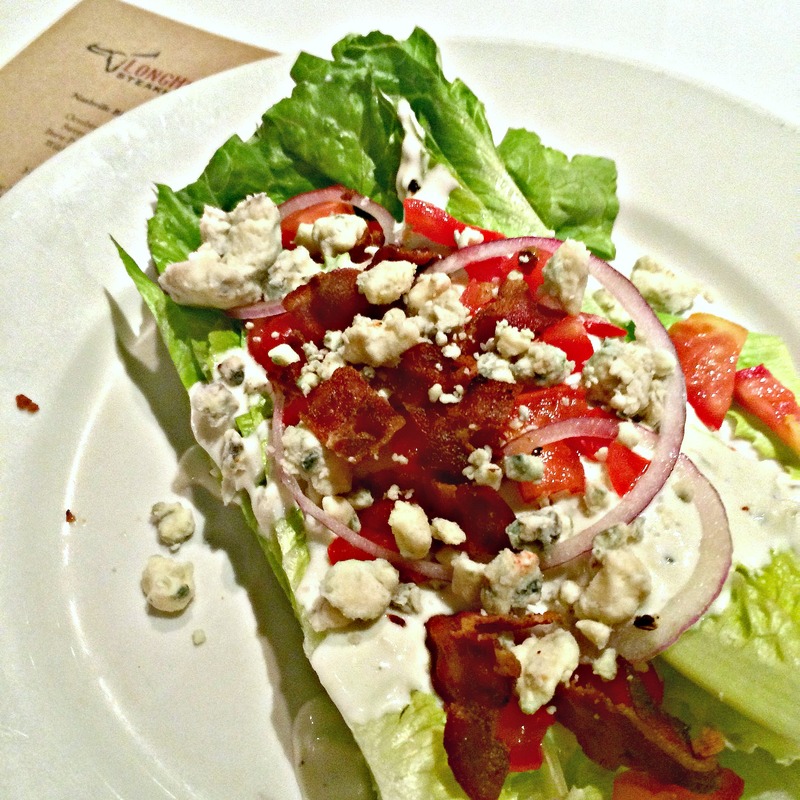 Seriously isn’t this a GORGEOUS wedge salad? 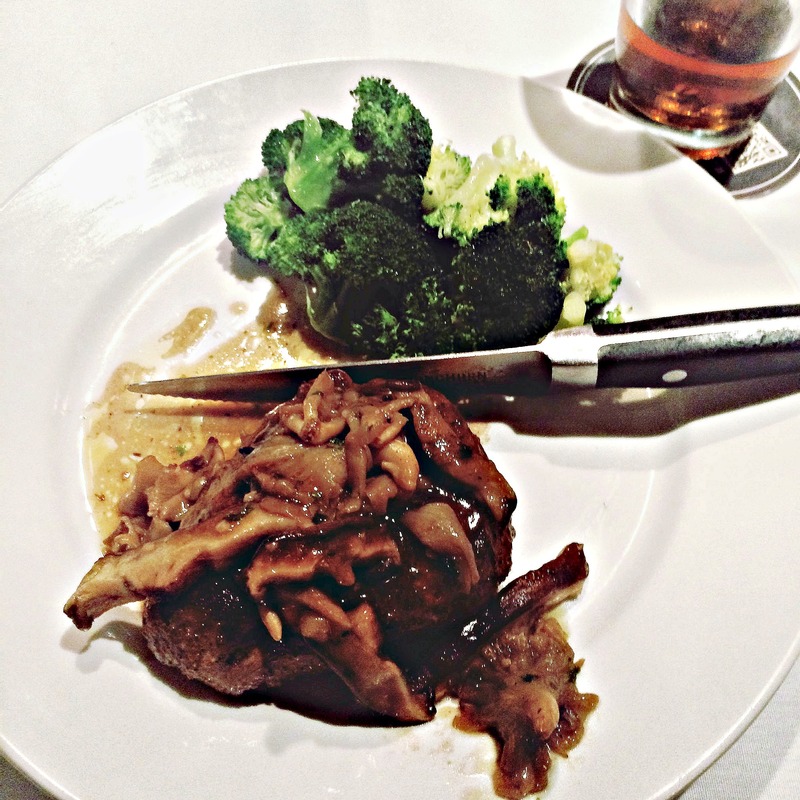 Next up was the star of the show…steak. I opted for a seasonal fall menu item, the Harvest Mushroom Filet. I ended up bring home some leftovers and my daughters both said it was the best steak they had ever eaten. I like my steaks medium rare and it was cooked perfectly. All grill masters at Longhorn are experts at their craft of grilling! Longhorn offers several sides for all types, whether you want healthier vegetable options or need your meat and potatoes. I ordered the fresh steamed broccoli as I knew desserts (plural) were coming but I had to sample the amazing Steakhouse Mac & Cheese, which has a delicious smoky flavor and bacon. You can’t go wrong with bacon or cheese people. Finally the two desserts we were treated to include Longhorn’s signature Chocolate Stampede and a fall specialty item, Pumpkin Spice Lava Cake. 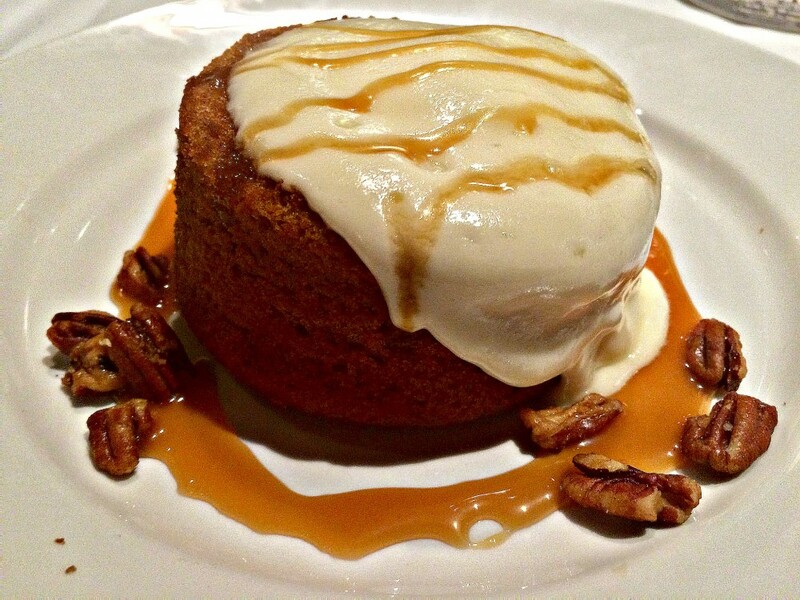 I am a huge fan of pumpkin and fell in love with the cake. I was also quite happy to take a piece home! Thank you to Longhorn Steakhouse for the event invite! I also enjoyed chatting with fellow Nashville area bloggers Alicia from Coilylocks, Mary from Minutes Per Mile, and Toye from Dish Up Love. Disclosure: My meal was compensated by Longhorn Steakhouse and I was under no obligation to post a favorable review. All thoughts and opinions shared on my blog are mine. 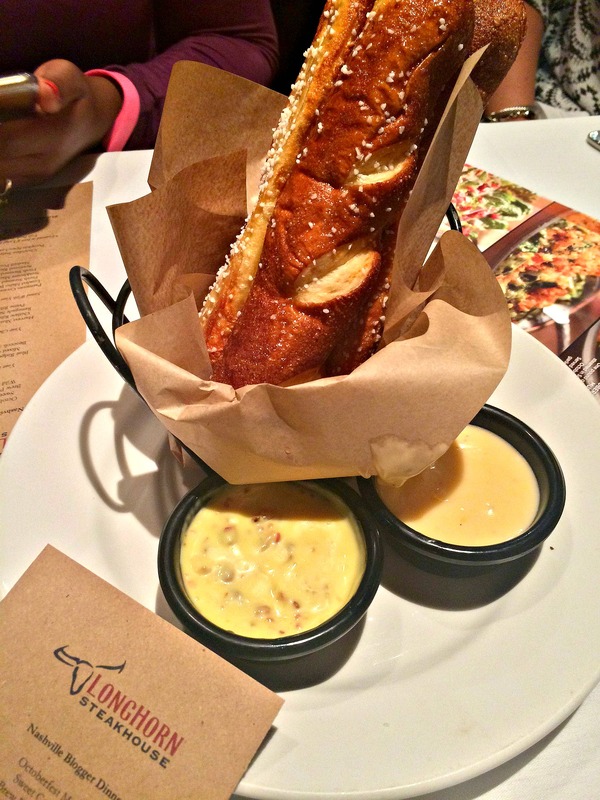 This entry was posted in Nashville, Reviews & Giveaways and tagged Longhorn, Nashville. I am only commenting to let you be aware of of the cool discovery our daughter gained viewing your blog. She came to understand plenty of issues, which included what it is like to have an ideal teaching mood to get other people quite simply know precisely certain complicated topics. You actually exceeded people’s expectations. I appreciate you for delivering the beneficial, healthy, educational as well as easy thoughts on the topic to Ethel. I used to be more than happy to seek out this net-site.I wanted to thanks to your time for this excellent learn!! I positively having fun with each little little bit of it and I’ve you bookmarked to check out new stuff you blog post.